KIRKUK, Iraq, Nov 8 2014 (IPS) - “Going back home? That would be suicide. The Islamists would cut our throats straight away,” says Khalil Hafif Ismam. The fear of this Mandaean refugee sums up that of one of the oldest yet most decimated communities in Mesopotamia. “We had our house and two jewellery shops back in Baiji – 230 km north of Baghdad – but when ISIS [Islamic State of Iraq and Syria] took over the area in June we had to leave for sheer survival,” recalls Khalil Ismam from the Mandaean Council compound in Kirkuk, 100 km east of Baiji. That is where he shares a roof with the family of his brother Sami, and the mother of both. The Ismams are Mandaeans, followers of a religion that experts have tracked back 400 years before Christ, and which consider John the Baptist as their prophet. Accordingly, their main ritual, baptism, has taken place in the same spots on the banks of the Tigris and Euphrates for almost two millennia. In the sixteenth century, Portuguese Jesuit missionaries attempted to convert them to Christianity in Basra (southern Iraq). Young Mandaeans were sent, often abducted, to evangelise far-flung Portuguese colonies such as today´s Sri Lanka. They were called the “Christians of St. John”, although Mandaeans solidly dissociate themselves from Judaism, Christianity and Islam. Khalil Ismam and his brother, both jewellers in their late thirties, also come from Iraq´s far south. Talking to IPS, they explain how they moved to Baghdad in the 1980s, “looking for a better life”. 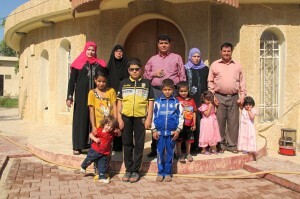 After the first Gulf War in 1991, they were forced to relocate again, this time to Baiji. Today they are in Kirkuk but they have no idea what tomorrow will bring. “The council has told us that we cannot stay over a month, but we still don´t know where to go next because ISIS is already at the gates of the city,” says Sami. Among the little they could take with them, the silversmiths did not forget their sekondola – a medallion engraved with a bee, a lion and a scorpion, all of them surrounded by a snake. According to Mandaean tradition, it should protect them from evil. Talismans are likely among the few things they can stick to while Mandaean ancient rituals begin to disappear as their priests are driven into exile in the best case scenario. In Kirkuk, the dry bed of the Khasa River – a tributary of the Tigris – is not an option so the increasingly rare ceremonies are held in a makeshift water well inside the complex. 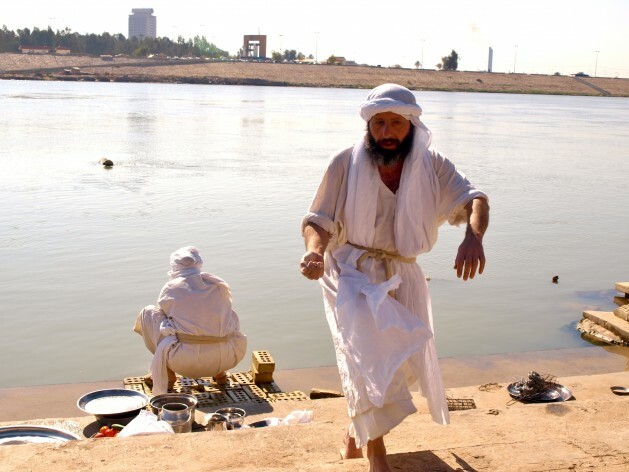 “Every two or three weeks a genzibra – Mandaean priest – comes from Baghdad to conduct the ritual but the road is getting more dangerous with each passing day,” laments Khalil Ismam, standing by the pond. According to a report released by Human Rights Watch in February 2011, 90 percent of Mandaeans have either died or left the country since the invasion by the U.S.-led forces in 2003. From his residence in Baghdad, Sattar Hillo, spiritual leader of the Mandaeans worldwide, told IPS that his community is facing their “most critical moment” in history, adding that there are around 10,000 of them left in Iraq. “In the past two months, our community in Iraq is suffering a real genocide at the hands of radical Islamists, and not just by ISIS”. Nashi told IPS that the situation is equally worrying in southern areas, where the followers of this religion are easy victims of either Shiite militias or common criminals. “The most striking thing about the killings of Mandaeans in Iraq is that it ranges from monetary gain by the extremists to the more sinister reason of ethnically cleansing the population of Iraq to get rid of the entire population of Mandaeans,” denounces Nashi. Khalima Mashmul, aged 39, is among the Mandaean refugees staying today at the local council. She tells IPS that she is originally from the south, but that she came to Kirkuk at the early age of 15, dragged by a forced population displacement campaign through which Saddam Hussein sought to alter the demographic balance of Kirkuk, where the Kurds are the majority. Kurds, Arabs and Turkmen dispute this city which lies on top of one of the world’s largest oil reserves. What Mashmul has called “home” for nearly 25 years is still considered as one of the most dangerous spots in Iraq. And she knows it well. “My husband is a police officer. He lost his right leg and four fingers of one hand after a bomb attack last June. Despite his injuries, they still force him to keep working,” this mother of four tells IPS. Like the Ismams, they cannot stay indefinitely. “We cannot go back home because my husband is threatened but we don´t have enough money to pay a rent,” laments Mashmul. Their only option, she adds, is that “Australia or any European country” grants them political asylum. That is likely the dream of the majority in Iraq. In a report on the Iraq crisis released last month, the United Nations Office for the Coordination of Humanitarian Affairs (OCHA) says that 1.8 million Iraqis have been internally displaced since January this year. The report also adds that 600,000 of them need urgent help due to the imminent arrival of winter. While many wait impatiently to move to a Western country, some others have opted for an easier relocation in neighbouring countries. “We have just been told that ISIS is gathering forces in Hawija – 50 km west of Kirkuk,” says the policeman, meaning that the offensive over Kirkuk is “imminent”. It’s odd that they believe in the existence of a god but that they don’t believe that this god has the ability to protect them from murdering rapists. Maybe god is imaginary? Jillian Galloway, could you possibly be more callous and insensitive, using this sad story of a people targeted for genocide to spout your atheism? We do believe that our God will protect us, this can happen when the Mandaeans uses their knowlegde, their ‘Manda’, to choose to go to the neighboors, countries such as Jordan and Turkey. So by choosing the right path, which is leaving our home land for a safer place to live in, God will guide us through and eventually lead us to a safer home.